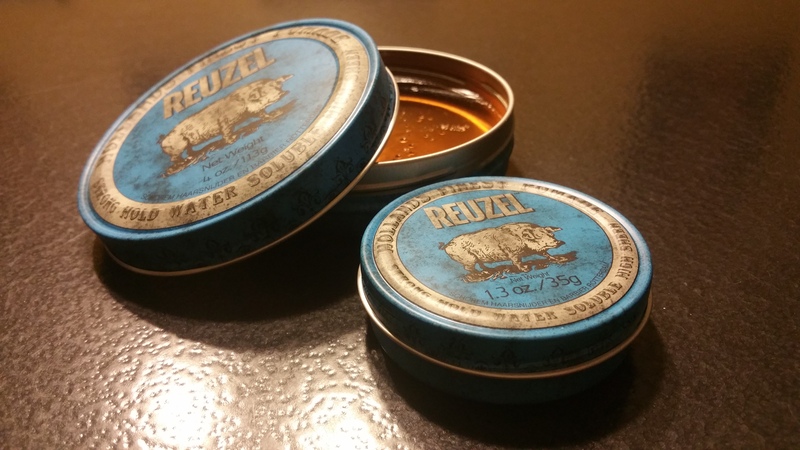 Reuzel is a dutch company which mostly focused on oil-based pomades, but they make 1-2 water based versions. We tried the blue tin. Up front, Reuzel products are fairly easy to find in Canada. Maybe not at your local pharmacy but quite possibly at your local barber shop or at the hair salon. Eleganza in Gatineau carries the full product line. It is packaged distinctively in a proper tin can and shows a pig. Another interesting fact is the size the tins are offered in; from the very small portable 35 g, as well as the more common 113 g and finally to the stockpiller option of the 340 g can. The pomade itself looks very good in a warm and inviting gold. It smells sweet, almost like honey. It’s easy to work with. It doesn’t take much to get your hair done. It holds. It dries somewhat less that the other pomades we have reviewed, but this might be because of their oil-based history. They made a water version but didn’t want to loose themselves too much by making a completely different product. Nevertheless, this is a very decent product. Easy to find and very affordable. I was able to get a mid-sized can for $13 at Eleganza in my local mall.